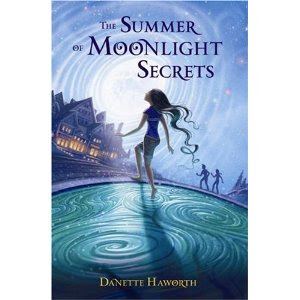 The Summer of Moonlight Secrets by Danette Haworth. Walker Books for Young Readers, Bloomsbury. Publication date June 2010. Review ARC from publisher. Middle Grade. The Plot: Allie Jo, eleven, lives at The Meriwether, an old hotel in Florida that used to be five-star and is still pretty famous and interesting. Chase, thirteen, is visiting The Meriwether with his travel writer father. Tara is a girl with a secret -- what is her secret? And what can Allie Jo and Chase do to help? The Good: The Meriwether is an old resort, a bit run down perhaps (some of the top floors are not just unused, windows are missing and rooms unusable), but still popular and still serves its Famous Blueberry Pancakes. Since Allie Jo lives at the hotel, it's her personal playground. While guest rooms and kitchens are off limits, she can eat as many Famous Blueberry Pancakes as she wants and take the secret hidden staircase up to the abandoned fifth floor. Haworth weaves interesting historical tidbits into her description of The Meriwether, such as secret staircases for nannys and porters and fainting couches. Allie Jo's best friend is away for the summer. Soon she and Chase, as well as Sophie, twelve, another summer guest at the hotel, are friends. I love the easy friendship these three fall into. Chase and Sophie fall for each other, and there is a cute kiss and holding hands. What is great? Is that Allie Jo doesn't care. There is never a hint of jealousy on Allie Jo's part, and Chase and Sophie don't do anything to seriously exclude Allie Jo. And then there is Tara. Tara, mysterious, nice, gracious, and a few years older than Allie Jo. Allie Jo, despite living in a hotel surrounded by people, is actually a pretty lonely child. She is friendly with the staff of the hotel; has great parents; at school, it is different. She is mocked as a "hotel rat" without money and has only one friend. Chase and Sophie become Allie Jo's friends, but Tara -- Tara is different. Tara is Allie Jo's secret; Tara is Allie Jo's puzzle; Tara is secrets; Tara is someone who trusts Allie Jo, and sees Allie Jo as a wonderful person and friend. Allie Jo begins to see Tara as not just a friend, but as something even more special. Knowing that Tara has run away -- not sure what parts of Tara's story to believe, Allie Jo, begins to see Tara as a potential sister. Allie Jo has a tape recording made by former guests at the hotel, two sisters, and she replays this tape recording of sisters over and over. A sister, who wouldn't go away, who would always be there. After all, Chase and Sophie are only at the hotel for the summer. Is Tara her answer? I don't want to give too much of Tara's mystery away. She trusts only two people to see her -- Allie Jo and Chase. When she tells the story, her language is a bit off, her observations a bit odd. Where is her family? Is she a runaway? When she does reveal her secret, will Allie Jo and Chase believe her? Will they betray her? Haworth does a terrific job of balancing Allie Jo's independence and autonomy with caring parents, including how that family relationship impacts Allie Jo's friendship with Tara. The Summer of Moonlight Secrets is about finding friends, becoming confident in yourself as a person, and figuring out the right thing to do. It is also funny! Allie Jo and Chase share some very corny jokes, and some only work well when read out loud. It took me a while to figure out just what was so funny about cinnamon aluminum linoleum. The setting was inspired by a bunch of places that I like: the springs are based on DeLeon Springs and Blue Springs here in Central Florida. The town is based on historical Mount Dora, a boutique town with brick roads, horse carriages, and a historic wooden hotel that dates back to the 19th century. That hotel, the Lakeside Inn, and various other structures in Central Florida (Leu Gardens and the house, Blue Springs' historic Thursby House, Winter Park, the Biltmore, and this one estate on a historic house tour I took years ago) share similar histories regarding the disparate conditions between society's elite and those who served them. Blueberry Pancakes--DeLeon Springs has a snack bar where you can sit down at these tables that have griddles built into the center of them. You can order a jug of pancake batter. Husbands and kids think this is a treat--I let them cook, haha! DeLeon Springs came to my mind instantly because it's the only spring I've been to that's contained by a retainer wall. Lawns surround it, and the river is just on the other side. Sitting in the pancake house, which used to be a sugar mill, makes you feel like you've gone back to a bygone era. I put the Meriwether on the same grounds. Blue Springs is a misnomer. The water looks blue in the shade, but in the sun, the water is a beautiful emerald green. And Blue Springs is a winter home for many, many manatees. Check out my blog for a photo I took there. Parts of Blue Springs are in the book, too--the lush, tropical woods, and the river that it runs to. These are the grounds of the Thursby House, which was actually listed on late 1800 maps as a stop because it was one of the few places in the area they could dock. Mr. Thursby began to book visitors, and the porters would bring the luggage right up the lawns. We moved around a lot, and my mom liked to explore. She had a knack for finding abandoned property. We discovered one huge house in Florida that was falling apart (The bathtub had fallen through the ceiling and rested on a heap of drywall near what we think was the parlor.) You could still imagine how grand it once was. The yard was beautiful in neglect. Vines thicker than rope dropped from treetops high above, and the philodendron leaves were big enough to sit on. There was always this feeling--what happened here? How did this become abandoned? Who once lived here? It was so much fun exploring these places, wondering whose feet once walked across floors we now crossed over. I can sometimes imagine it so strongly, it feels like a time warp. But it sounds like a book I'd like lots! Oh fun! DeLeon Springs pancakes are wonderful and I'm so happy their inspiration is in a middle grade book. Can't wait to read this one. What a great email from the author - so glad you contacted her for this info! I have now said cinnamon et seq. out loud, and am no wiser--it's obviously a tounge twister, but surely there's more?